One thing it is not, however, is a great browser for the web in general. The refresh rates for the very readable electronic paper, used by the Kindle and Sony Reader, are still too low for interaction with the web. You aren’t going to see videos and you won’t be playing games, and you need much patience to load many sites since most of them aren’t considerate enough to provide mobile interfaces—including this one (and that’s a little sad, which is why I’m thinking of reloading the current theme (( )) to be something rather simpler). However, given that the Kindle is really for reading and not so much for browsing, I haven’t minded. But I much prefer to read on my Kindle than the screen, if only because I don’t feel like stabbing my eyes out after hours of intense reading. 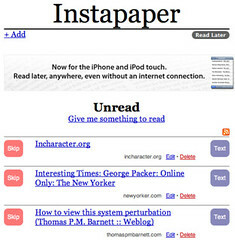 Enter Instapaper, whose default interface is already geared towards mobile browsers. 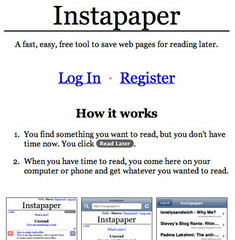 Instapaper is different kind of bookmarking service. It neither stores bookmarks efficiently/indefinitely, like del.icio.us; and neither is it socially-orientated, like StumbleUpon. 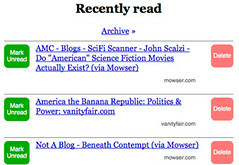 Instead, it keeps track of sites you’d like to read later and, when you’ve later read it, marks it off as read. 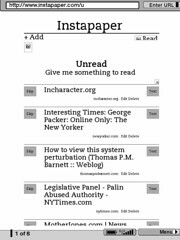 There’s a Read Later shortcut bookmarklet you can use so that a simple click will send the current website you’re looking at to your Instapaper inbox. The bookmarklet supports most modern browsers including the Big Three—Firefox, Internet Explorer, and Safari. Instapaper, of course, can also be used for your normal browsing experience. And now, a gallery of using Instapaper in the Kindle’s web browser. Instapaper home on the Kindle. 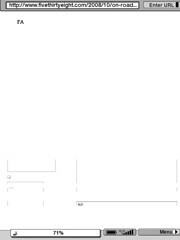 For a faster experience, I turn off images. They aren’t going to matter most of the time, unless you’re looking at really depressing stock market graphs. Which I could do without. 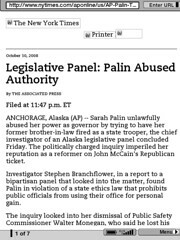 The New York Times lets you access the print versions of their articles from anywhere, and it’s fairly nice. Most blogs don’t have entry print versions, so I use Instapaper’s Text link instead. It does quite well, although I’m starting to really hate websites that think that using “font-size: 75%;” as the default text size is a good idea. I really do love virtual train wrecks. Nothing is boring when you can watch the slapfight between the pundit blogs afterwards. There’s also nothing like watching shared misery across hundreds of websites, even if you are also one of the miserable. And now, if you’ll pardon me, I’ve got a lot of reading to do….